3D printing is one of the marvels of the 21st century. With its origins in the 1980s, the process has become increasingly common over the last few decades, leading some to believe that it’s as simple as using “3D CAD file you can put it into a 3D printer and print,” says Dr. Jing Zhang, Associate Professor of Mechanical and Energy Engineering at IUPUI. “But,” he notes, “that’s also a misunderstanding because there are many issues in 3D printing.” Zhang leads a project that uses IU’s supercomputers Karst and Big Red II to simulate 3D printing with metals in order to make the process more efficient and less expensive. 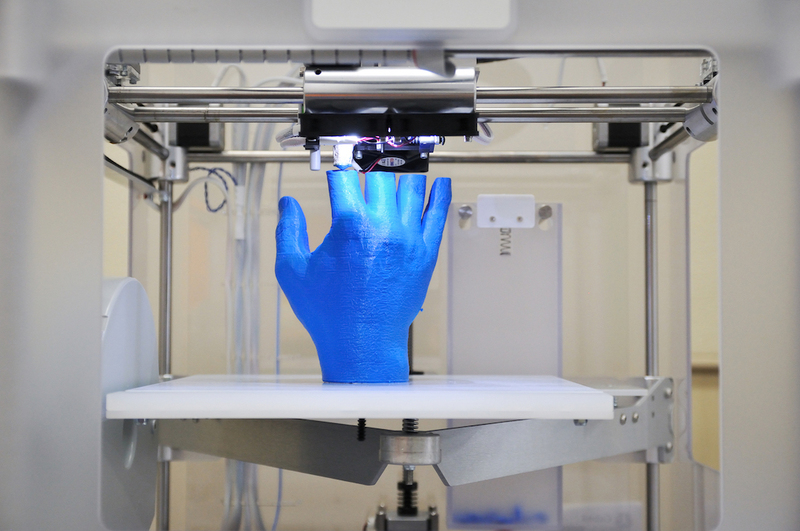 The materials used in 3D printing fall into three main categories: polymers (plastics), ceramics, and metals. Zhang’s team focuses mainly on metals, with particular attention to 15-5 PH stainless steel. Though it is widely used for tooling purposes due to its high tensile strength and resistance to corrosion, 15-5 steel has not been widely studied for 3D printing. However, metal 3D printers, and the metal powders used in them, can be extremely expensive, rendering printing mistakes quite costly, and making simulation a vital part of the process. As Zhang explains, “The material is an issue, and how do you choose the correct chemistry, the particle size, and the optimal printing parameters are critical.” His goal for 3D printing with 15-5 PH stainless steel is to produce a plastic injection mold that cools through conformal cooling, in which circular channels are used to efficiently cool down the mold’s temperature. These channels can’t be produced through traditional machining methods, making the mold an ideal subject for 3D printing. Before the simulation, Zhang’s lab conducts mechanical testing on the steel in order to understand its properties and how they will respond during the printing process. Using the properties measured from the testing, the team models the 3D printing process in a multi-scale, multi-physics simulation framework. They examine the steel at 3 levels: the molecular level, which looks at the motion of the atoms or sintering during printing; the discrete element level, which treats each particle of the material as a single point; and the finite element level, which examines individual 3D printed components. Because the 3D printing process is high-temperature and highly dynamic, using lasers or electron beam to melt the metal powder, and generating the part layer by layer, the parts often fail. The simulations allow Zhang and his colleagues to examine the process at different scales, investigating heat transfer and stress, and determining how cracks and distortions might develop in 3D printed metal parts. After the simulation, the team is physically testing their conclusions using the metal 3D printers of their collaborators, Praxair Surface Technologies and the US Army Research Laboratory. While the physics involved in simulating the 3D printing process is (relatively) simple, the number of particles and parameters involved makes supercomputers necessary. A typical simulation, for instance, involves 100 particles of about 4,000 atoms each. The parallel computing and large memory systems offered by Karst and Big Red II allow Zhang and his collaborators to simulate this level of detail. To learn more about this work, see the articles in the following journals: Additive Manufacturing (Finite Element Simulation and Experimental Validation of Distortion and Cracking Failure Phenomena in Direct Metal Laser Sintering Fabricated Component, https://doi.org/10.1016/j.addma.2017.05.002), Powder Technology (Discrete Element Modeling of Powder Flow and Laser Heating in Direct Metal Laser Sintering Process, https://doi.org/10.1016/j.powtec.2017.04.002), and Journal of Materials Research (Sintering Phenomena and Mechanical Strength of Nickel Based Materials in Direct Metal Laser Sintering Process - A Molecular Dynamics Study, https://doi.org/10.1557/jmr.2016.230).